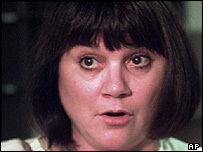 US singer Linda Ronstadt was booed and removed from a Las Vegas casino for praising film-maker Michael Moore and his film Fahrenheit 9/11 during a show. Ronstadt called Moore a "great American patriot" and "someone who is spreading the truth" during a performance at the Aladdin venue on Saturday. Some among the crowd of 4,500 stormed out, tore down concert posters and tossed cocktails into the air. Aladdin president Bill Timmins said Ronstadt was escorted off the property. Ronstadt "spoiled a wonderful evening for our guests and we had to do something about it", Mr Timmins said. He said the 58-year-old singer, booked to play the Aladdin for one show only, was not allowed back in her luxury suite after the show. He said she would not sing at the Aladdin again: "As long as I'm here, she's not going to play." In a statement directed at Mr Timmins, Michael Moore said: "For you to throw Linda Ronstadt off the premises because she dared to say a few words in support of me and my film is simply stupid and un-American." Ronstadt's manager was not immediately available for comment. However, in an interview with the Las Vegas Review-Journal before the show, Ronstadt was reported as saying: "I keep hoping that if I'm annoying enough to them, they won't hire me back." Moore said the casino's move was "stupid and un-American"
Michael Moore said Mr Timmins owed Ronstadt an apology. "Invite her back and I'll join her in singing America the Beautiful on your stage," he said. 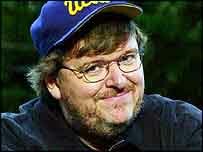 "Then I will show Fahrenheit 9/11 free of charge to all your guests and anyone else in Las Vegas who wants to see it." Ronstadt began her career in the mid-1960s with the folk-rock group the Stone Poneys and later emerged as a solo country artist. She achieved success in the 1970s working alongside artists such as The Eagles, Dolly Parton, Emmylou Harris and Aaron Neville. During the 1990s she won Grammys for albums of Mexican and Latin music, and one of rock classics redone as lullabies. This week, Elton John said stars were scared to speak out against war in Iraq because of "bullying tactics" used by the US government to hinder free speech. Last year the Dixie Chicks were also booed for criticising President Bush when the band's name was mentioned at the Academy of Country Music Awards in Las Vegas.